Home News New Cancer Therapy: Food Poisoning? 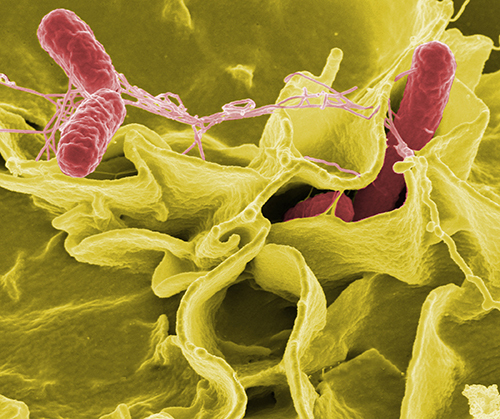 Credit: Rocky Mountain Laboratories,NIAID,NIH Color-enhanced scanning electron micrograph showing Salmonella typhimurium (red) invading cultured human cells. While bacteriotherapy may sound like some new age skin treatment or colon cleanse that you hear about as part of a new Hollywood diet trend on late night infomercials, it is, in fact, a sound medical tool that researchers and clinicians utilize to treat disease. “Bacteriotherapy is the use of live bacteria as therapy to treat a medical condition, like cancer,” explains Robert Kazmierczak, Ph.D., a senior investigator at the Cancer Research Center and a postdoctoral fellow in the Division of Biological Sciences at the University of Missouri (MU) College of Arts and Science. Now, Dr. Kazmierczak and his colleagues at MU are looking to exploit the mechanisms that microbial invaders use to traverse cells, in order to treat various types of cancer. To that end, the MU researchers have recently published data where they describe the development of a nontoxic strain of Salmonella that can target and penetrate cancer cells. The scientists are optimistic that the results from their study could lead to promising new treatments that actively target and control the spread of cancer. According to the Centers for Disease Control, 48 million Americans contract foodborne diseases annually, with Salmonella being the leading cause of illness. Salmonella has a unique characteristic that allows the bacteria to penetrate through cell barriers and replicate inside its host. The MU investigators developed a unique Salmonella strain, CRC2631, that has been genetically modified to render the bacteria nontoxic and enhance its natural ability to target and kill cancer cells—without harming normal, healthy cells. Once the Salmonella strain was created, the researchers began to search for a system in which to test their potentially new cancer therapy. They settled on a mouse model of prostate cancer and administered the bacteria directly into the circulatory system. Not only were the bacteria able to find and preferentially target the tumor, the scientists saw a reduction in the tumor growth following the administered dose. Interestingly, CRC2631 is derived from a Salmonella sample that was stored in a test tube at room temperature for more than 50 years. The sample originates from the Demerec collection, a collection of mutant strains of Salmonella collected by geneticist Milisav Demerec, Ph.D., and curated by Abraham Eisenstark, Ph.D., scientific director at MU’s Cancer Research Center (CRC) and professor emeritus of biological sciences at MU. The collection contains over 20,000 different samples of Salmonella, with half of the samples housed at the CRC where researchers affiliated with MU focus on three areas of cancer research: early detection, targeted treatment, and new, effective chemotherapy.